Google Scholar gauges the influence and visibility of articles in academic journals and scholarly publications. Armed Forces & Society is now the 7th-ranked military studies publication. For more information and to see other rankings, click here. The IUS has expanded our online presence by setting up accounts on each of the main social networks. From Twitter and Facebook to Google+ and LinkedIn, the IUS's new social media initiative will notify you of all IUS updates. In addition to news from the IUS, we're going to be working to use each of these hubs to allow IUS Fellows to meet and sustain the kind of professional relationships that make Fellowship such a worthwhile pursuit. Social networking allows organizations like the IUS to continue the conference experience to our membership through the entire year by providing discussion platforms for research, opportunities, and conversation. With the addition of a YouTube account, we'll also be able to make video content available. There's no need to follow every account; information will be shared across all platforms while continuing to be posted here on the IUS website. Add the IUS on your preferred network and you'll start connecting with your peers instantaneously. Help support the IUS by making a donation today. The Morris Janowitz Career Achievement Award is awarded by the Inter-University Seminar on Armed Forces and Society to a limited number of senior scholars whose careers most demonstrate excellence in the study of armed forces and society and important service to the discipline. 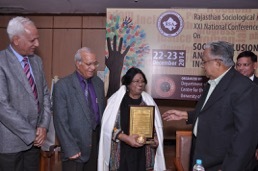 IUS fellow Dr. Leena Parmar received the Lifetime Achievement Award for her contribution to the field of military sociology at Rajasthan University in India. As a Professor of Sociology at Rajasthan University, her achievements span 40 years of research, teaching, and dissertation supervision. Please join us in congratulating her contribution to our field. What drives retired military officers in China toward contention? Decades of research on protest has produced little on veterans’ collection action, and even less on that by ex-officers. Newspaper reports, police journals, and veterans’ blogs show that contention by Chinese former officers (ranging from occupying government compounds to marches, mass petitioning, open letters, and class action lawsuits) is the result of bad luck in post-military job assignments, a fragmented political system that makes it difficult to ensure that pensions and other benefits reach retirees, and pervasive corruption that leads ex-officers to feel that local officials have embezzled funds meant for them. Contention by former officers typically uses military rhetoric and builds on military experiences, even for former officers who were employed in civilian jobs for many years. Although contention by ex-officers is not likely to rock the state, it says much about how “sticky” military identities are, where veterans fit in the political landscape, Leninist civil–military relations, and the treatment that old soldiers receive in a fast changing socioeconomic order. Meeting at the conference, in Mogadishu, from left to right, Hassan Madadallah, Professor in the Nelson Mandela School at School of Public Policy and Urban Affairs, Southern University and A&M College; Paul R. Camacho, an IUS Fellow, William Joiner Institute for the Study of War and Social Consequences, University of Massachusetts, Boston (retired); and Abdi Dirshe, an IUS Fellow and Permanent Secretary, with the Ministry of Foreign Affairs. Dr. Paul R. Camacho, a long-time IUS Fellow, was invited by the Federal Government of Somalia to participate in its Conference on Internal Security held in Mogadishu on 20-23 April 2014. Camacho made a formal presentation on Security Sector Reform: Challenges and Opportunities. He emphasized the importance of taking a holistic rather than a purely military approach to overcome security problems.